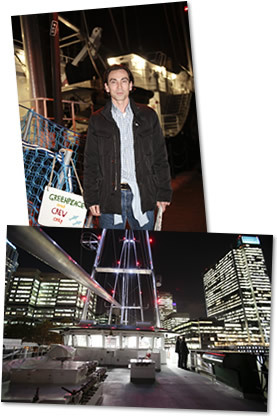 A few days ago, I was lucky enough to attend the inaugural Captain’s Dinner aboard Rainbow Warrior III. The state-of-the-art, motor-assisted sailing yacht is the first Greenpeace vessel to be purpose built, and is intended to be one of the greenest ships afloat. It replaces the ailing Rainbow Warrior II (converted from a deep-sea fishing boat), and this summer was used to mark the 26th anniversary of the bombing of the first Rainbow Warrior. It’s an ancestry which shows how far the organisation has come. For the last forty years, Greenpeace has put to sea to take direct action against environmental damage. From rusting, old or re-purposed boats, they’ve campaigned with immense bravery against everything from nuclear weapons testing to whaling. In this latest ship, they’ll be able to address a new tide of ecological challenges. Among other things, they’ll be able to stream live footage of environmental issues to the world’s media; carry up to eight tonnes of equipment for environmental research; and spot illegal fishing and timber shipping by helicopter. It’s an impressively ambitious venture, and one that’s close to my heart. Long may their victories continue. This entry was posted in Talking Ocado and tagged Greenpeace, Rainbow Warrior III by Ocado. Bookmark the permalink.